Enter Kranix, Epistolary Librarian of the Dark Angels. Well, been a busy couple of days. Got the Forge World in, and got everything of mine put together. I am painting the Deimos Hyperios Whirlwind in Adeptus Mechanicus colors. But, supplies not withstanding, I switched out to painting on more Deathwing. 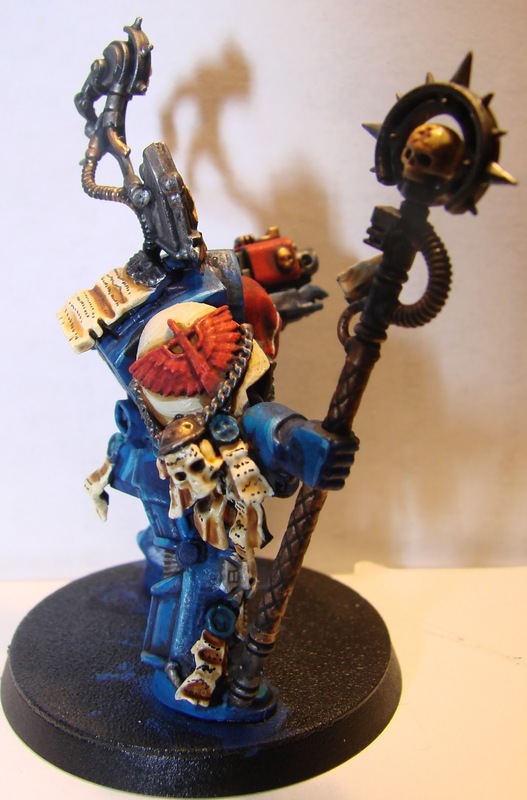 Here is Epistolary Kranix, of the Deathwing. 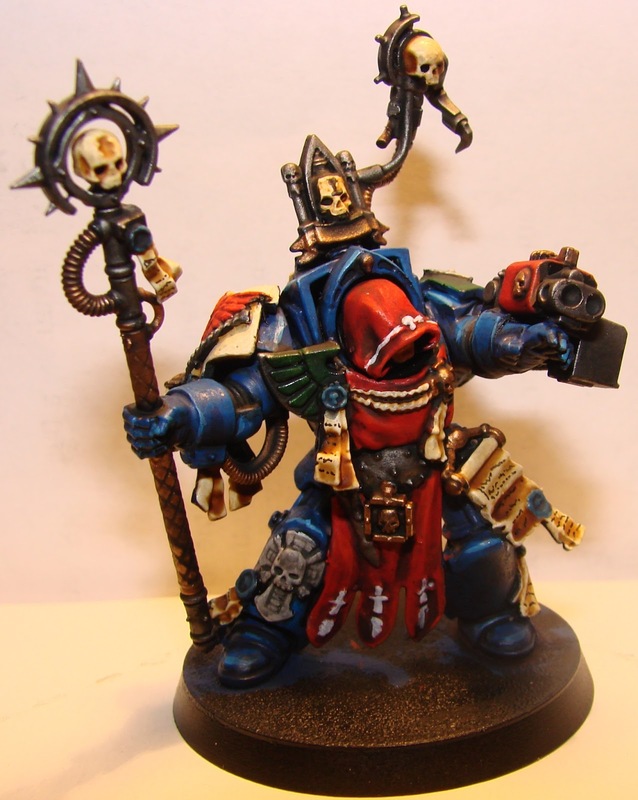 I decided to stay with the traditional Librarian colors of blue for the armor, and then add Dark Angel and Deathwing trim. Did not do the tabard in Dark Angels Green because it would have blended into the blue on the armor, so I went with the 5 stage red. The blues are Cygnar Blue Base, highlighted with Cygnar Highlight, and then a final highlight of Cygnar Highlight mixed with some white. Final wash with Drakenhoff, and the blue is nice and deep. The Crux pad was painted with Dark Angels green, washed with Thraka, re-highlighted with DA Green, and then a final wash of Nuln Oil. To keep the purity seals differentiated from the bone of the Deathwing pad, I did those in Menoth White Highlight, highlighted by white, then washed with Seraphim Sepia. Final touch was to take my .005 Micron pen and add some litanies to the seals and scrolls. He came out pretty nice. Once he is based and matte varnished, the colors should really pop. Weeeee! The Forge World order is here! Well, the Forge World order came in. When I got the box, I was pretty excited. Popping open the box, I found the 3 Vendetta kits and the 2 Tallarn Sniper teams for Ben, and the Deathwind shoulder pads for Cassie's army and buried at the bottom was all the stuff to build my Deimos pattern Helios Whirlwind. $32.00 For the Helios platform and $50 for the Deimos Rhino kit, or $62 for the Helios Whirlwind kit, and since the Helios would be serving multi armies, I went with the Deimos and Helios platform - yeah, I know, $82 for a Whirlwind.....must be out of my mind! Okay, we will start off with the shoulder pads. 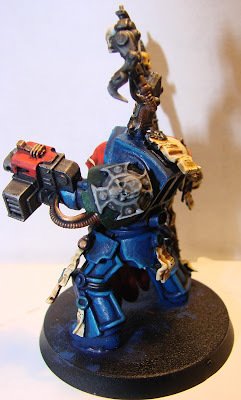 When combining the standard terminators with the Deathwing command box, I started noticing that the shoulder pad mounting area on the DW box arms were sometimes WAY larger than the standard terminator ones. The FW pads just reinforced that point. In most occurances, I had to press the living snot out of the pad to keep the gluing surfaces touching. But the end result is pretty nice. Belial, Deathwing Commander and Kranix, the Librarian are all finished and ready for primer. These really add a nice, ornate look to the kitbash Belial. Want to make sure he stands out, although how can you miss him with that big honking banner on his back. I took the last 6 remaining pads and divvied them up amongst the command squad. When I was putting them together, I made a list of who was getting which side of pads. 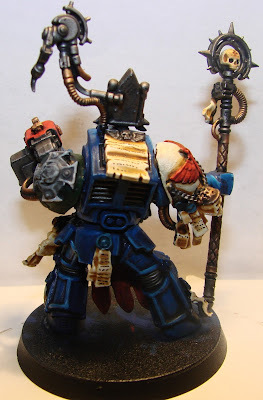 The Champion of Caliban received both sides, the Apothecary and Standard bearer received the DW side, and the other 2 dude received the Crux pads. Really helps them to stand apart from the other 20 terminators in the list. And now onto what I was really waiting for - the Deimos Helios Whirlwind. I pulled up the large and 2 small bag with all the parts. The bag labelled for the platform stand was promptly chucked over my should and I popped open the bag on the Helios launcher. First off, I will say that I have worked with a lot of Forge World stuff over the years. This round of stuff was amazingly free of air bubbles and serious flash. Most parts were pretty smooth. I did, however, have issue with the mounting holes on the launcher. They were not punched all the way through and the one on the right side looked a bit off. I went ahead and carved out the 2 holes, being sure that they were lining up right. The rest of the parts went together really well. I glued everything in place and set it off to the side to dry. Now onto the Deimos Rhino chassis. Honestly, I think that the guys at FW could have come up with a better way to make the deimos, other than replacing the entire side plate of the Rhino. Resin, although it can produce really fine castings, has a tendency to shrink a lot after molding. Well, I got to see a ton of that first hand. Let's just say the side plates were a fight. I trimmed up everything and then commenced to assembly. Unlike most other Forge World kits, this one has pretty nice instructions. Basically, it has you put the rhino together, with the top, but minus the outer hull pieces. These are replaced with the kit pieces. Front plate had no fitment issues after initial trimming. Fit nice and tight - no gaps. I will note that the front plate is THICK! So think, I don't think it could have warped. I went ahead and put all the rest of the pieces on, with no real fitment issues at all. The side doors were a bit of a pain, but with minimal trimming, they went on. It was when I went to attach the tracks that I started noticing the major issues. As I was mounting the tracks, I noticed that they would slope on the road wheels. Not a big issue, I figured completing the tracks would correct it. NOPE. From this picture, you can see the "bowing" of the tracks. The cooling resin actually pulled the model out of square, leaving it with a bit of a wobble. Here you can see the back of the tracks.....they slope to the outside of the model. You can't really tell it here, but the tracks still slope. Another thing to note - the tracks heading into the body.......On the standard Rhino, these are a PITA - but on this thing they are even worse. On the inside of the resin piece, the little platform guides for the tracks are not there, so you have to really careful when putting them in, or they drop into the body. All in all, I am pretty happy with the overall look of the kit - the sloping tracks kind of piss me off. For an $80 model kit, this thing should be PRISTINE - not left to the tender mercies of shrinking resin......Oh well, it's here, and together. Going to let it dry overnight and then throw some primer on it tomorrow, as well as prime all of the other stuff that is together to get ready for the late week paint fest that happens after work. I am going to paint the Deimos Whirlwind in Adeptus Mechanicus livery, so that way it looks like a Mechanicus operated field test.